Hilma af Klint is born on October 26 at Karlbergs slott (Karlberg Palace) in Stockholm to Captain Fredrik Victor af Klint and Mathilda Sontag. She is the fourth of five children. The family moves to Norrtullsgatan in Stockholm. They spend their summers at the family estate, Hanmora, on the island of Adelsö in Lake Mälaren. 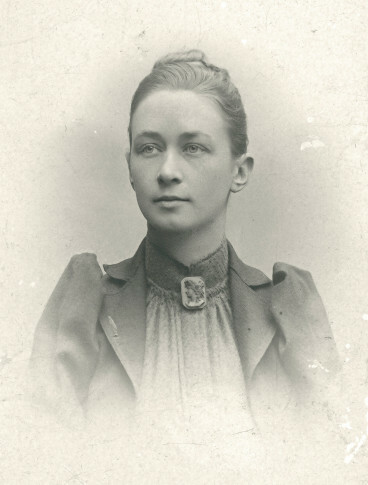 Hilma af Klint attends the Normalskola för flickor (General School for Girls). Hilma af Klint attends the Tekniska skolan (Technical School) and classes in portrait painting. Her sister Hermina dies and the loss spurs on Hilma af Klint’s interest in religion and spiritualism. She attends the Royal Academy of Fine Arts. Her teachers include Georg von Rosen and August Malmström. 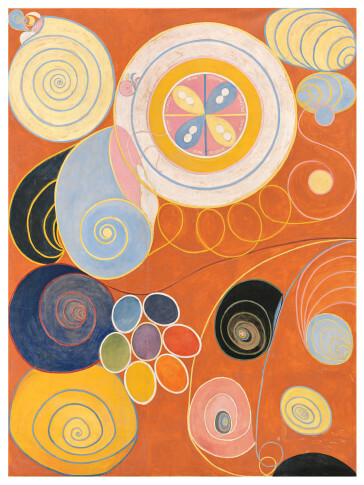 Hilma af Klint graduates with honors from the Academy. The Art Academy places a studio at Hamngatan 5 at the disposal of Hilma af Klint and two other artists. She paints portraits and landscapes in a naturalist style. Hilma af Klint regularly attends spiritual meetings with four female friends. The group call themselves “The Five”. During their séances, they make contact with so called “high masters”. The Five begin to document their experiences in notebooks. The group also practices automatic writing and drawing, which means writing and drawing without consciously guiding the movement of the pen on the paper. Her father dies. Together with her mother, Hilma af Klint moves to Brahegatan 52 in Stockholm. During a séance, she is told that she will be commissioned to make paintings on the astral plane. Her works are to represent the immortal aspects of man. She starts working on The Paintings for the Temple, which will comprise several different series and groups of paintings on various themes. The first, preparatory group is called Primordial Chaos and consists of twenty-six fairly small pictures. 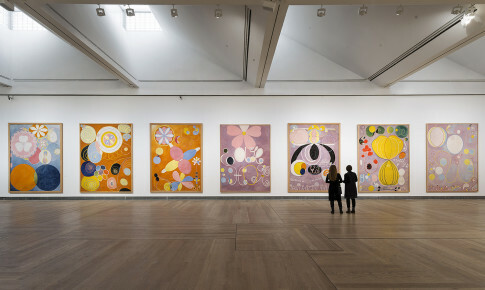 According to Hilma af Klint, these paintings are created mediumistically, that is, under the guidance of a high master. Her work is kept secret and shown only to a chosen few. In order to take better care of her blind mother, Hilma af Klint gives up her studio on Hamngatan in early summer and moves into a study in the building on Brahegatan. A four-year pause in her work on The Paintings for the Temple begins. During this period, she also refrains from painting naturalist works, with the exception of a portrait in 1910. 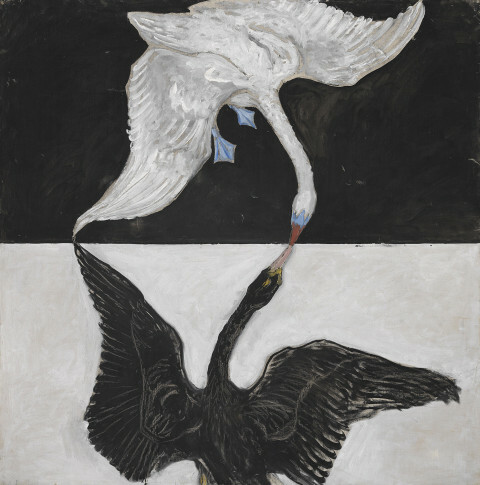 Hilma af Klint’s early naturalist paintings are exhibited by the Föreningen Svenska Konstnärinnor (Association of Swedish Women Artists) at the Royal Academy of Fine Arts in Stockholm. Together with friends, Hilma af Klint rents Villa Furuheim on the island of Munsö in Lake Mälaren. She resumes work on The Paintings for the Temple. Several new series and groups are painted under the influence of spirits, but her work is significantly more independent than it had been previously. These works include The Swan and The Dove groups. In June, she participates in the congress of the Theosophical Society in Stockholm. She shows naturalist paintings at the Baltic Exhibition in Malmö. Artists from the Nordic and Baltic countries, Germany, and Russia participate in the show. The Russian section features works by Wassily Kandinsky. Hilma af Klint concludes The Paintings for the Temple with the three large Altarpieces. She continues creating metaphysical pictures. Her approach is now more independent. She paints the Parsifal series. Construction work begins at Furuheim on Munsö for a studio for Hilma af Klint’s paintings. She paints the geometrically abstract Atom series, in which her strong interest in the natural sciences is palpable. 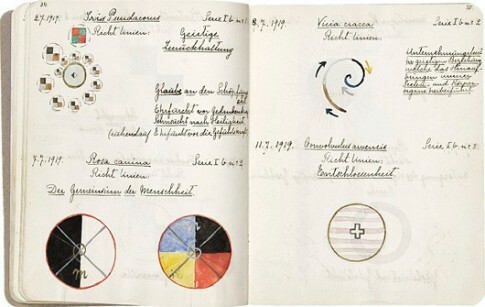 Hilma af Klint also dictates her thoughts on spiritual. When the text is transcribed, it comprises 1,240 typewritten pages. She moves to Furuheim with her mother. Her mother dies. An intensely creative year begins. Hilma af Klint moves to Helsingborg with Thomasine Andersson, who had been her mother’s nurse. She joins the Anthroposophical Society. In the fall, they visit Dornach in Switzerland, where Hilma af Klint meets Rudolf Steiner (1861-1925), the founder of the Anthroposophical society. After her first trip to Dornach she stops painting for more than a year and subsequently gives up geometric abstraction. After this hiatus, she paints predominantly water-colors and strives to allow the colors to generate the subject matter. She spends long periods in Dornach, studying anthroposophy and attending many of Rudolf Steiner’s lectures. There are no paintings or notes dating from the period 1925 to 1930. She lives at Skolgatan 17 in Uppsala. She moves to Grönegatan 28 in Lund. She moves to live with her cousin Hedvig af Klint in Djursholm. She leaves her artistic estate, comprising more than 1,000 works and just over 125 notebooks, to her nephew, Erik af Klint. Hilma af Klint does not want it to be shown until at least twenty years after her death.